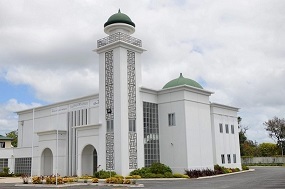 ‘Always Well-rounded and Auspicious,’ was the added message at the Annual Reunion Dinner organised by Fo Guan Shan, the Buddhist Temple and Community Centre located at the East Auckland suburb of Flatbush yesterday (Saturday, January 19, 2019). More than 1000 men, women and children attended the event, held as a tribute to the friendship and goodwill that the Buddhist Temple, its Abbess and volunteers offer to the communities and pray for their welfare. “No matter how far away they are, and what business they are conducting, every member of the family will try their best to be reunited for this Special Meal,” was the special message of Venerable Master Hsing Yun, Founder of the Fo Guan Shan Buddhist Order and Buddha’s Light International Association (BLIA) in 1967. That message was reflected by Venerable Manshin, the Abbess at the Flatbush Buddhist Monastery, who led the Prayers at the Temple. This was preceded by ‘Dances of Hope and Joy,’ by groups of young and elderly men and women in front of the imposing, ten-feet high Jade Statue of Lord Buddha. Abbess Manshin said that the Teachings of Buddha have inspired human kind for thousands of years and that following them will lead to universal happiness. “We seek the Blessings of Buddha to rid this world of violence and destruction. Let us all spread love and goodwill towards one another and promote peace and happiness. The dawn of the New Year is time to reflect on human values,” she said. She said that ‘Humanistic Buddhism’ encompasses all Buddhist teachings and the goal is to achieve harmonious living. Quoting the Venerable Master, the Abbess said that in every home, a new day dawns; old peach wood charms are replaced anew. “2019 is the Year of the Pig. Of the twelve zodiac signs, the pig symbolises a way to round up the year and start a new beginning of life. I am concerned about Cross-Strait peace and the development of Humanistic Buddhism. I need to work harder,” the Venerable Master in a message to all followers. As it is rare to encounter the Buddha’s teachings and have such a great Dharma teacher, both monastic and lay disciples should strive vigorously to follow in Venerable Master’s footsteps of propagating Humanistic Buddhism. Among the other speakers at the event were Inspector Rakesh Naidoo of the New Zealand Police, newly appointed Director General of the Taipei Economic & Cultural Office in Auckland Jeff Y J Liu, Howick Local Board Member Adele White and Buddha’s Light International Association (Northland) President Stephen Yu. The Programme included the famous ‘Dragon Dances,’ and other cultural performances. The Temple will celebrate the Chinese New Year Eve on Monday, February 4, with a special longevity, wishing and paying respect to Buddha’s Dharma Service. The event will commence at 9 pm. The following day (February 5), the Temple will conduct the ‘Dharma Function’ at 10 am along with the Vegetarian Food Festival. 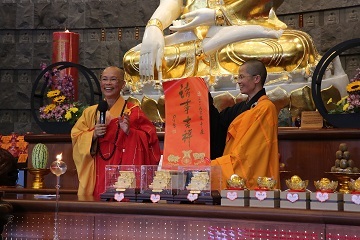 According to the Golden Light Sutra, the offering to Universal Buddhas and Heavenly Kings Dharma Function provides devotees an opportunity is an important occasion. This Special event will be held on Saturday, February 16, 2019 at 8 pm. Located on a sprawling 3.6 hectares of land in Flat Bush, East Auckland, the Fo Guang Shan Temple is the largest Buddhist Temple in New Zealand. Designed in the architectural style of the Tang Dynasty, the Temple took seven years and $20 million to build. It includes a ten-foot high Jade statue of Buddha (made in Burma and Taiwan), weighing eight tons and a two-ton bell. Opened in 2007, the Temple aims to promote Humanistic Buddhism. Its activities include crime prevention talks, courses on Yoga, Martial Arts, Chinese Calligraphy, Chinese Language, social and community service and other issues of interest.